In today's world of shopping, savvy mobile shoppers and price transparency are the norm. There is a lot of talk these days from Target to Best Buy to Wal-Mart to better leverage their physical stores as a competitive advantage against Amazon. They are trying to combat showrooming, which was a big concern about 2 years ago. More and more retailers are putting in place pick-up in-store capabilities, which is a great option for consumers. However, I have found that some major retailers are still charging different prices (usually higher prices in store) between the online and offline channels, indicating there are still silos in these companies and channel conflicts have not been resolved. Exhibit A: Petco. It is not uncommon to find prices online that are lower than their in-store price. 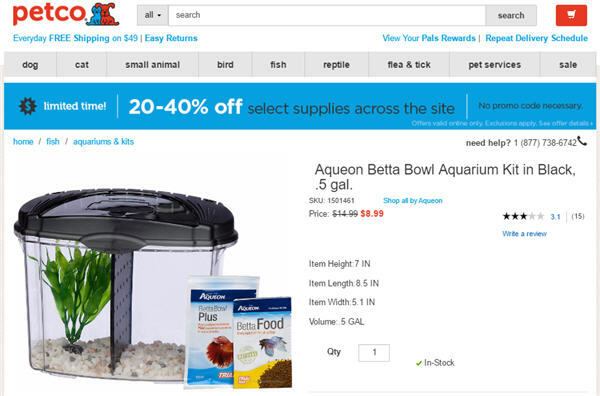 In the example below, the aquarium appears to be on sale for $8.99. I lobbed in a mystery shopper call to my local Petco and found out they would charge me $14.99 if I walked in to the store. I asked why is it cheaper online and the store clerk really had no idea and just said that online prices are different than the store. No apologies and no offer to match their own online price! Not even if you are in their loyalty program and shop there all the time! In this case here, if I bought it online, there was a $5.99 shipping charge, which made online 1 cents cheaper than in-store, but that doesn't account for the delayed gratification and gas savings from online shopping. Exhibit B: Verizon Wireless. Despite being the #1 wireless carrier, Verizon's online, call center, and local retailer channels are often not aligned. Online and the call center tends to offer the same prices and deals. But local retailers sometimes have different offers and can't match their online prices. There are back-end data issues as well as in-store reps often say they can't see certain customer info that the call center can. No idea why as that seems to be more of a problem a decade ago! Exhibit C: Best Buy. Best Buy has had a rough few years and is a poster child of how mobile shopping and showrooming really disrupted their business. But they have made bold moves by redesigning their in-store experience and putting in place an aggressive price match policy. I was first shocked to learn they even price match again Amazon! Yes, I said Amazon. On a few occasions, I found a lower price on m.BestBuy.com when I was looking for product reviews while shopping in-store. When I asked a sales associate about the lower price, I was happy to learn they matched their own online sale prices!!! What a novel idea! You hear that, Verizon and Petco? It's a pretty wild concept to match your own prices. I suspect many retailers have lower prices online (even if they are doing pickup in store) because of the price transparency from online shopping that creates cutthroat pricing strategies (a.k.a. the Amazon effect). Google Shopping and its Product Listing Ads that often show on top of the SERP further exacerbates the pricing transparency problem for retailers. Despite retailers trying to create a seamless multi-channel experience leveraging their stores better, I am shocked how many still #FAIL.